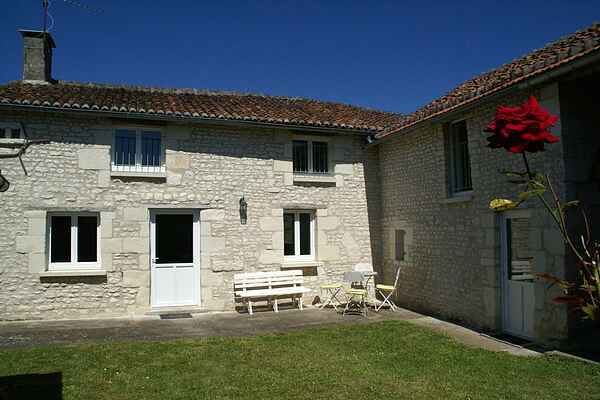 This former farm in the village of Les Bruères has been tastefully renovated and transformed into a nice holiday home. The authentic details have been preserved but with the comfort of today. The interior is a beautiful mix of rural and modern. You will find the original exposed wooden beams throughout the house and all the rooms are comfortably and nicely finished. This pretty detached house includes a nice courtyard (90m2 and fully enclosed, making it ideal for your pet) where you can enjoy a glass of wine from the region on the terrace out of the wind. You can enjoy the view over the rolling pastures on the covered terrace at the back while the kids play on the grass. Daily shopping, restaurant, tennis court and swimming pool in Richelieu (5 km). The stately, medieval town of Richelieu is rich in history and was founded in 1631. Wine lovers are at home here. The fortified city of Chinon (21 km) is surrounded by vineyards and there are also many areas where you can \"taste\". Not to be missed, of course, is the beautifully preserved Abbey of Fontevraud (37 km). And what about the impressive châteaus (castles) in Azay-le-Rideau (28 km), La Roche-du-Maine (20 km) and Le Rivau (11 km)?